The story takes place in a world called "Ivalice," in an age when magic was commonplace and airships plied the skies - the Archadian Empire, seeking to strengthen its base of power, had been invading and subjugating its neighboring lands one by one- a fate which befell the small Kingdom of Dalmasca. Archadia's invasion and the subsequent death of the Dalmascan king prompted the Princess Ashe, the sole surviving heir to the Dalmascan throne, to take up arms against the invaders. In her struggle to oust the occupying Archadian forces and restore freedom to her people, Ashe must watch as many of her allies pay the blood price for that freedom. Though tempted to abandon all hope in the face of the Empire's might, her determination keeps her from succumbing before what would seem to be inevitable defeat. Then she meets Vaan, an urchin from the Dalmascan capital of Rabanastre. Vaan dreams of one day becoming a sky pirate, escaping the Empire on his airship. 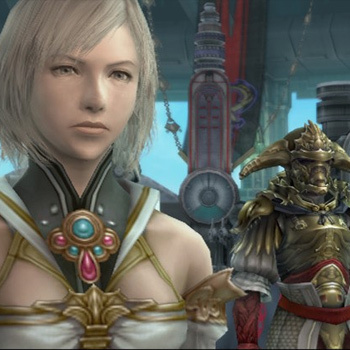 Vaan, Ashe, Vaan's friend Penelo, the sky pirate Balthier, his partner Fran and many more are on an adventure through Ivalice that traces the mysteries behind the Archadian Empire's invasion. Bringing with it a wide array of new gameplay elements, Final Fantasy XII will change the way players think about the Final Fantasy series. Numerous possibilities abound within each scenario, allowing for a less linear, more unique experience for each player. The game also supports Dolby Pro Logic II both in-game and during movie sequences, immersing the player in the middle of the action.